We know how to win SEC whistleblower rewards. 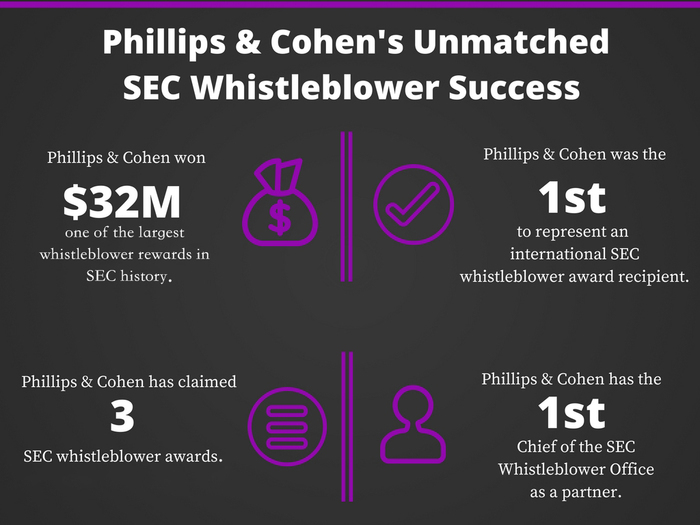 Phillips & Cohen has won several SEC whistleblower awards for its clients. This includes one of the largest SEC whistleblower awards under the Dodd-Frank whistleblower program: more than $32 million. We also have won two additional SEC awards for other clients: one for $3 million and one for $325,000. Our whistleblower cases under all government reward programs have resulted in recoveries totaling more than $12.3 billion in civil settlements and criminal fines. Overall, our clients have received whistleblower awards totaling more than $1 billion. We know how Wall Street works. We represent whistleblower clients in the financial industry around the world, from traders to CFOs to others in the executive suite. Our SEC and CFTC whistleblower cases cover a wide range of violations, such as allegations of bribery of foreign officials (violations of the Foreign Corrupt Practices Act); rate and price manipulation of securities, options, and derivatives; money-laundering schemes; cryptocurrency fraud involving initial coin offerings (ICOs); improper accounting practices; insider trading; Ponzi schemes; mischarging securities transactions (by algorithm or otherwise); front-running; and improper characterization and reporting of risky assets. We had success with whistleblower cases involving financial frauds even before the Dodd-Frank Act created the SEC and CFTC whistleblower reward programs in 2010. For instance, we represented an investment banker in a whistleblower case that exposed the practice of “yield burning” in the municipal bond market and resulted in Goldman Sachs, Lehman Brothers and other major Wall Street firms paying more than $200 million to the federal government to settle their cases. We know how the SEC works. Our experience with the SEC and its whistleblower office gives us valuable insights that benefit our clients. No whistleblower law firm knows the SEC whistleblower program better than Phillips & Cohen. Sean McKessy, a Phillips & Cohen partner who was the first Chief of the SEC Office of the Whistleblower, led the SEC’s efforts to set up the program and its policies and processes. For five years, he was in charge of evaluating whistleblower claims and making whistleblower reward recommendations. Phillips & Cohen partner Erika Kelton has had signficant success for clients with the SEC whistleblower program. She has won three SEC whistleblower awards for clients and has many other whistleblower claims pending, giving her significant insight, experience and knowledge that benefits the firm’s clients. We know how to build strong cases for our whistleblower clients. Our work sets us apart. We invest time and resources to build a strong case before we submit a claim to the SEC. This helps our clients’ claims stand out and enables the SEC to clearly see the significance of our clients’ information. The SEC receives thousands of whistleblower claims each year and can only pursue a limited number of whistleblower claims at a time. Our work makes it more likely the SEC will investigate. We know how important confidentiality is, and we always act with our clients’ interests in mind. We take our clients’ desire for confidentiality very seriously, as does the SEC. The Dodd-Frank Act has strong whistleblower confidentiality provisions and allows whistleblowers to file claims anonymously as long as they are represented by counsel. If you would like to discuss with Phillips & Cohen a possible whistleblower claim with the SEC or CFTC, please contact us using our encrypted form or call us at 202-833-4567 in the US. We also can be reached at our London office: +44 (0)20 7406 7555.